This is another Park that delivers what it promises. 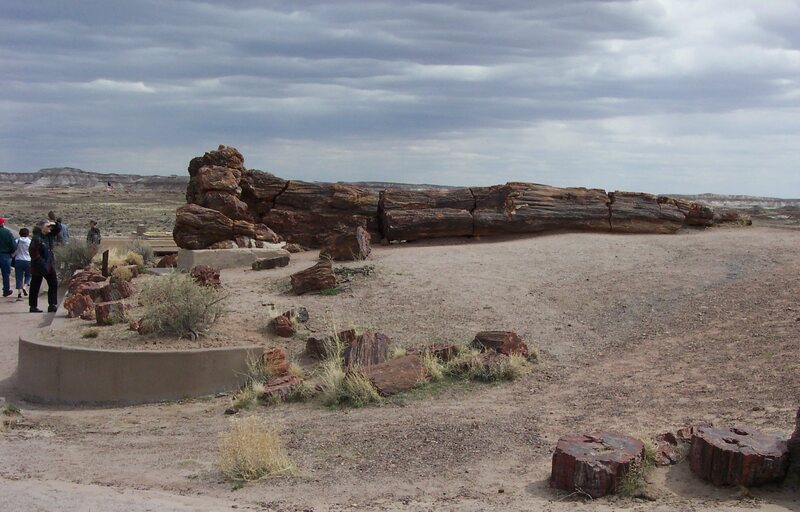 The Petrified Forest has one of the world's largest concentrations of petrified wood. It also boasts the multihued badlands of the Painted Desert, along with archaeological sites and displays of 225-million-year-old fossils. In short, there are plenty of reasons for a visitor to spend time here, exploring the past, present and future. The Petrified Forest now sits on a high, dry tableland, but that wasn't always the case. Long ago this was a vast floodplain crossed by many streams. Indeed, some scientists think that this was once part of a watershed system greater than the Mississippi. Tall pine-like trees carpeted the area. Huge crocodile-like reptiles, small dinosaurs and giant amphbians called this place home and lived among the ferns, cycads, and other plants that are only fossils today. The tall trees fell during floods and were washed downstream, where they were covered by silt, mud, and volcanic ash. This blanket cut off oxygen and slowed the decay of the logs. Next, groundwater seeped through the logs, bringing with it silica sediments, replacing the original wood tissues with the silica deposits. 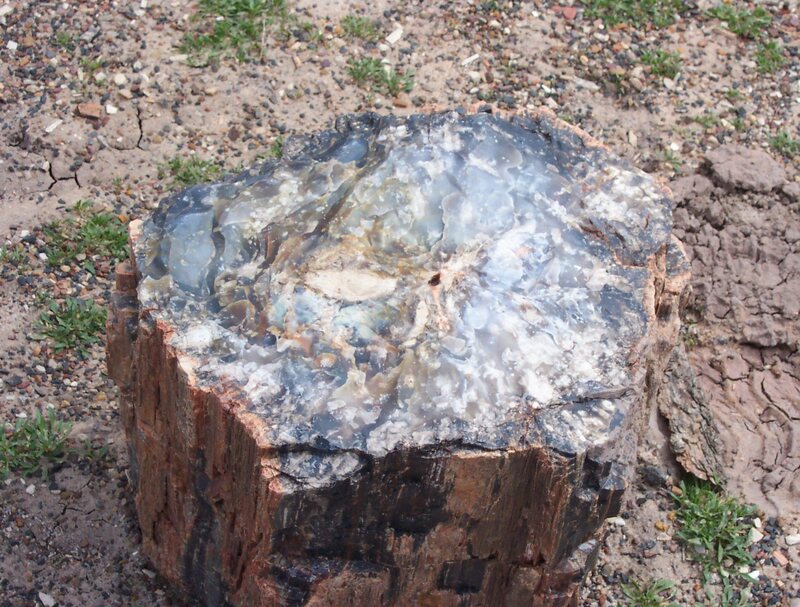 Eventually the silica crystallized into quartz of many different colors, and the logs were preserved as petrified wood. That was about 225 million years ago, in the Late Triassic Period. Time passed, and the area sank and was flooded with fresh water and its sediments. Later, the whole area was uplifted high above the water. This caused stresses on the wood, and fractured the giant logs. Finally, over time, wind and water have worn away the layers of hardened sediments, exposing to our eyes the fossilized remains of ancient plants and animals. 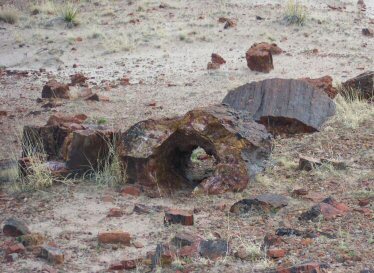 This process continues today, and the hills still yield fossil treasures as the wind and rain carve the soft clay soils of the Painted Desert. The Park can be separated into two main areas. 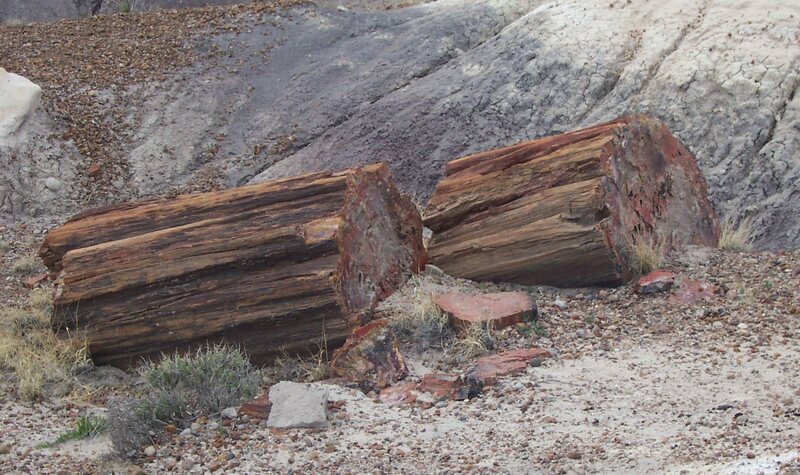 The southern part of the park is where you'll find the greatest concentration of fossilized trees. Don't overlook the Rainbow Forest Museum, located near the southern entrance. 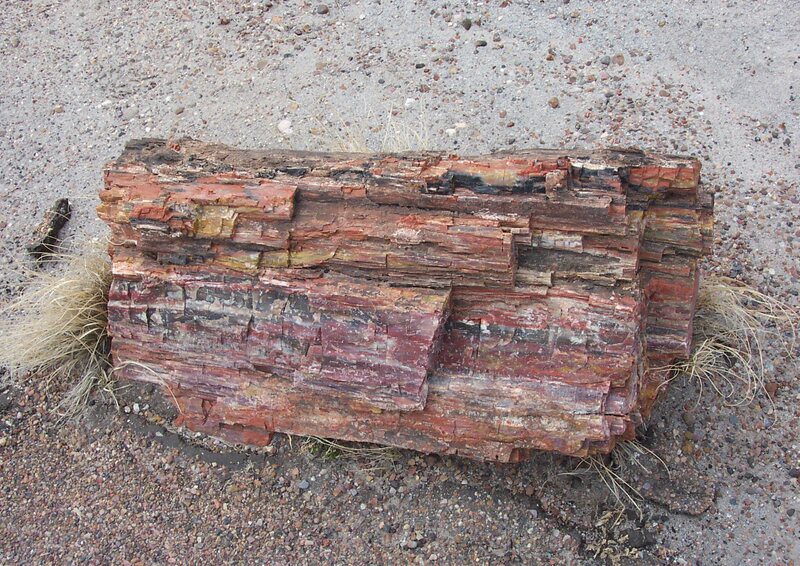 Inside you'll find a brilliantly colored example of petrified rock, cut and smoothed to perfection. One road links both ends of the park, so take your time driving south to north, and stop at the various pullouts to enjoy the beauty. At the other end of the park, generally north of I-40, lies the Painted Desert. This colorful expanse of rolling hills has attracted attention ever since visitors first came to this area. Millions of years ago, sediments were laid down in layers, and today we can enjoy white sandstone bands, darker clays above it, iron-stained red siltstone, and other hues that pull the eye to all directions. 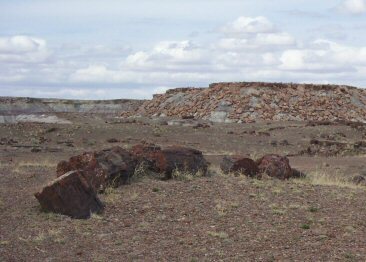 The Teepees, cone-shaped formations of layered blues, purples, and grays created by iron, manganese, carbon, and other minerals, are easily seen from the road. The Painted Desert Inn was built in 1924 on an unstable foundation, and it's been in a process of neglect or repair ever since. It became a National Historic Landmark in 1987, and offers extensive views of the Painted Desert, and murals by Hopi artist Fred Kabotie. There is evidence of Native American habitation here as well. 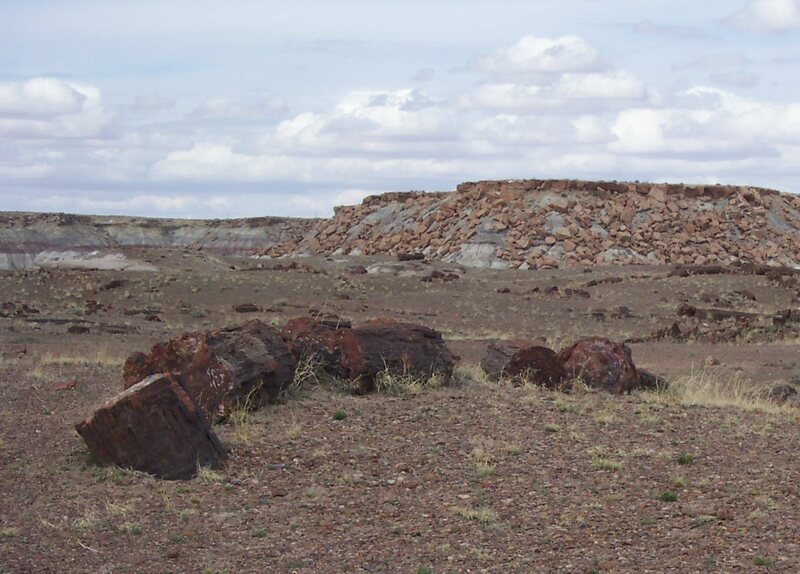 Puerco Pueblo was found by the Spanish in the 1500's, but it had already been deserted for at least one hundred years. This is a partially stabilized 100-room pueblo built about 1250 A.D. It may have housed up to 1,200 people at one time. 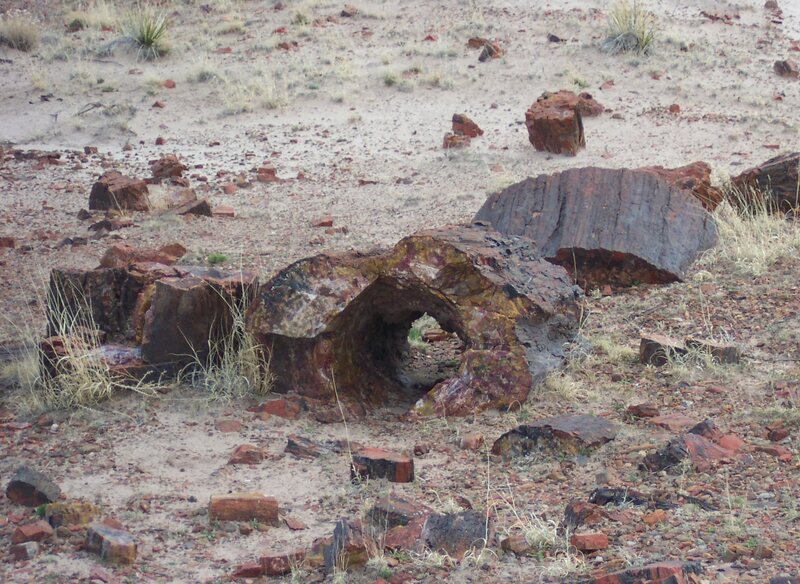 There are many stories of human occupation in the Painted Desert, dating back 10,000 years or so. We don't know the complete history, but certainly many groups of people moved through this area at different times. Today we can walk through Puerco Pueblo and imagine how they lived; we can see (through spotting scopes) hundreds of petroglyphs etched into stone at Newspaper Rock. Visitors can enjoy backpacking, hiking, watching film, walking, and watching wildlife. There are Ranger-led interpretive talks, walks, and hikes of lengths from a third of a mile to two miles, none of them too strenuous. The visitor centers have archaeology displays, the Rainbow Forest Museum, trails and guidebooks. 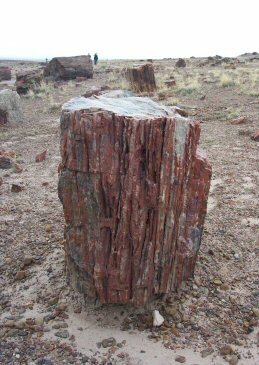 I first visited the Petrified Forest at the beginning of a July downpour; I was advised by concerned rangers not to leave my car. 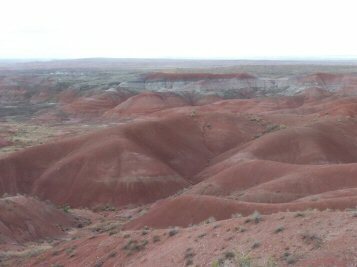 So, the picture of the Painted Desert is the one good photo I got of that section of the Park. I took it just north of the main Visitors Center. Then in March of 2005, during a long weekend at a cabin in Pinetop, I was able to sneak away for half a day and see the Petrified Forest. Aha! Now I now what the fuss is about. But why is it that, every time I visit a Park famous for its colors, I'm blessed with cloudy weather? Hey, at least I made it. This trip I only got to see the southern part, but it is impressive. Petrified logs are scattered about, boasting amazing minerals and colors. The National Park Service has been fighting theft of these rocks ever since the Park was established; as a matter of fact, the loss of these treasures was a prime motivation for establishing it in the first place. There are places, near the high-visibility visitors center, where logs are surrounded by small chunks and tiny chips of fossil. 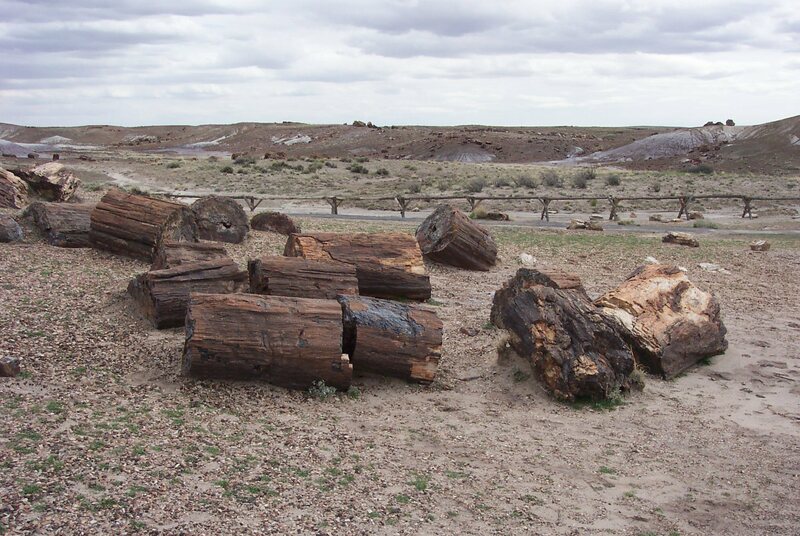 There are other places where the incredibly heavy logs (they can weigh over a ton per linear foot) have nothing around them but sand and brush. Clearly, scavengers have been at work, stealing bits and pieces for their own personal stash. Please don't do it; they are irreplaceable. 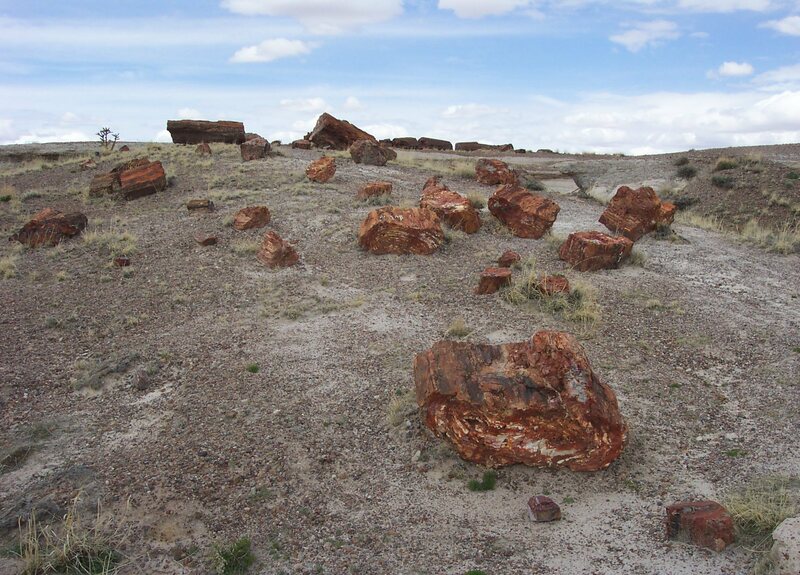 There are shops, just outside the border to the Park, that sell petrified rocks (gathered from private land) -- buy them there, promote the local economy, and protect our National Park. This is an easy park to explore. The trails range from easy to moderate, and the longest is two miles. Take some time, wander around, get a feel for how our earth changes over time. You won't regret it. From Flagstaff, travel east on I-40 to exit 311. Turn right on that road, and it will lead you directly to Park Headquarters in less than a mile. To the north, Hubbell Trading Post National Historic Site is about 40 miles away, and Canyon de Chelly National Monument is about 80 miles away. To the west, Sunset Crater Volcano National Monument and Wupatki National Monument are about 85 miles away, and Walnut Canyon National Monument is about 95 miles away. Meteor Crater (privately owned) is about 60 miles to the west. El Morro National Monument is about 95 miles east, in New Mexico. Visited July 2004, March 2005.